On a humid summer day in Palmyra, New York, a friend of mine asked, “So what is it about the idea of additional scriptures that makes you Evangelicals so nervous?” This question came from my friend, a Latter Day Saint (LDS), as we were touring the original printing press for the Book of Mormon. He is a historian and a religious scholar, and served the mandatory two-year Mormon mission, so I knew that he was not asking me for a simple refresher on the Evangelical position on the “closed canon” of Scripture. Instead, he wanted me to help him understand the underlying fears and issues at stake in terms of Evangelical faith and doctrine with regard to this issue. At the time I had just finished working on a book with Rabbi Elliot Dorff on the topic of Jewish and Christian approaches to social ethics. The Jewish Approach to Repairing the World (Tikkun Olam): A Brief Introduction for Christians,1 is an overview on both the commonalities and differences in the way the two religious traditions have historically approached a variety of social issues ranging from parenting to poverty. In a prior version of the book, Rabbi Dorff talked about Messiahship and the person of Jesus of Nazareth. Like many Jews, Dorff still holds out for a future messiah and believes that Jesus did not “fulfill the job description” prophesied in Scripture. For Dorff, there is too much discontinuity between the person and work of Jesus and Jewish expectations of God’s promised messiah.2 What struck me on that day at the printing press in Palmyra was that my Mormon friend believes that the LDS Church has additional scriptures that do not contradict, but are in continuity with the Old and New Testaments of the Bible. He wants me to seriously consider the claims of their prophet, Joseph Smith. On the other hand, I am in a reversed role with my Jewish friends: I believe that the additional Christian Scriptures of the New Testament do not contradict, but are in continuity with the Old Testament that Jews and Christians embrace as authoritative. And I want my Jewish friends to take seriously the claims of the Jewish Messiah Jesus of Nazareth. What I found myself saying to my LDS friend informed the type of dialogue that needs to take place with my Jewish friends. The onus is on those who came later and who claim allegiance to the prior Scriptures to demonstrate continuity of story, message, and character of God. It is my experience that Christians have much to learn from a focused dialogue with Judaism—both in terms of the content of their theology and practices, as well as their critique of Christianity. Such learning can help address deficits in the Christian community. For example, I have benefited greatly from my study of Jewish approaches to mourning and grief. The five stages of mourning that instruct the community to surround the bereaved with support and to accompany them on their year-long journey through the mourning liturgies has been a timely word for me and my church community.5 I have also learned much from Rabbi Dorff’s critiques of Christianity. In contrast to the Hebrew notion of giving to the poor as an act of tsedekah (justice), Christianity has been co-opted by American “feel-good” religion and the view that helping the poor is a virtuous (and therefore optional) act of charity.6 While Dorff’s critiques were of Christian lifestyle and not of the gospel itself, they nonetheless point out ways in which a large portion of the American Evangelical church (myself included) has seen giving to the poor as going beyond what is required of us. Together these Jewish teachings and practices have helped me move from Christian ideas about love and community to biblical practices that embody these commandments. 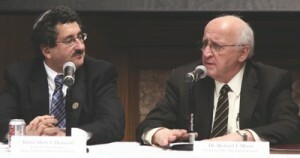 Fuller president [1993–2013] Richard J. Mouw (right) is committed to the “convening power” of the seminary (see “Witnessing, Learning, Cooperating: Fuller’s Commitment to Civil Dialogue”) and has promoted rigorous dialogues, including those between leaders from the Jewish and Christian communities (at left, Rabbi Mark S. Diamond in 2010). This understanding of repentance played a major role in shaping how I went about the task of preaching at an interfaith retreat for seminarians that included both Christians and Jews. The two-day event brought together Jews, Roman Catholics, and Protestants. Each tradition conducted a worship service for the others to observe and participate in. For my sermon I chose to preach on Jesus and the Psalms of Lament. My text was the narrative of Jesus raising Lazarus from the dead in John 11. The aim of my sermon was to proclaim the gospel of Jesus in such a way as to critique American Evangelicals—after all, to love a tradition is to seek its health through a candid critique from within. I concluded my sermon by telling a story of my friend Rabbi Dorff. The previous year, close friends of mine were involved in a horrific car accident that claimed the lives of two of their friends and their own seventeen-month-old son. In the weeks following the accident, the wife’s own life and recovery was uncertain. I contacted Rabbi Dorff that same week and told him the story, and asked for his prayers. His response to me remains unparalleled. He said, “Cory, I pray every morning, I will add your friends to my prayers, and I won’t stop until you tell me to.” I have never experienced such an expression of solidarity in suffering. I see in Rabbi Dorff’s response an excellent model of the Christian task in this present world of suffering. In light of Romans 8:22–30, we are to follow the Holy Spirit in embracing the pain around us, in those areas where there is a disconnect between God’s promises and purposes and our lived reality. We are to continually cry out to God, “how long O Lord?” until we hear the words, “Behold I make all things new. I am wiping every tear from every eye. Death and pain and mourning are no more,” (Rev. 21:4–5). Until God takes creation and humanity beyond the reach of sin and death. On that day we will say, “Where, O death, is your victory? Where, O death, is your sting?” (1 Cor. 15:55).12 The sting and victory of death will be swallowed up by Jesus, the lamb who was slain. This was my attempt to take what I had learned from my studies in Judaism and to put forth the gospel of Jesus in continuity with the Old Testament and in a posture of repentance. My entry into Jewish-Christian dialogue began with learning about Judaism from a rabbi. The task seemed simple enough, I was asked to read through Rabbi Dorff’s book on Jewish social ethics and to find Christian texts that spoke to the same social concerns. Little did I know that this straightforward assignment would open a whole world in my studies and reshape my own faith in Jesus. My experience, far from leading me away from Jesus or Scripture, has done the opposite. I am more committed to Jesus the Messiah and to the Scriptures that contain his gospel. What has changed is the manner in which I go about this commission from God. Rabbi Dorff opened the door to dialogue with Jews with his discussion of Jesus not fulfilling the job description of the messiah, and my conversation with my LDS friend helped me know how to walk through that door by talking about Jesus in Jewish terms. My experience with Jewish-Christian dialogue has been like Peter’s story in Acts 10 in reverse. Instead of Peter, a Jew, finding himself shocked and then rebuked as he learned about God’s surprising work even as he proclaimed the gospel of the Jewish Messiah to a household of Gentiles, I have found myself, a Gentile Christian, shocked at the surprising work of God amidst the Jewish tradition. I have been repeatedly rebuked and corrected in terms of the lingering gnostic strands in my Christianity, and illuminated through fresh readings of Scripture in light of my new learning from Jews. I have come to expect that I will be surprised at God’s work among my Jewish friends as I learn from the content of their theology and practices and remain open to their critique of Christian practices even as I engage in the work of putting forth Jesus as the promised Jewish Messiah. 1. Rabbi Elliot N. Dorff, The Jewish Approach to Repairing the World (Tikkun Olam): A Brief Introduction for Christians (Woodstock, VT: Jewish Lights Publishing, 2008). 2. Rabbi Elliot N. Dorff, The Way into Tikkun Olam (Repairing the World) (Woodstock, VT: Jewish Lights Publishing, 2005), 248–49. 3. Cf. Richard J. Mouw, Uncommon Decency: Christian Civility in an Uncivil World (Downers Grove, IL: InterVarsity Press, 1992), 48–49, 11–18. I have been helped in my understanding of how to keep the ninth commandment by Gordon Fee, who writes, “Before you say, ‘I disagree,’ you must be able to say, ‘I understand.” Gordon Fee, New Testament Exegesis: A Handbook for Students and Pastors (Louisville: Westminster John Knox, 2002), 33. 4. Granted, continuity between the Old and New Testaments and between Judaism and Christianity has been downplayed by both religious traditions over the centuries. Rabbi David Novak argues that one of the major motivators for this within the Jewish community has been the need to resist forced assimilation to the dominant surrounding Christian society as well as to mark out a distinct self-understanding for the Jewish people. Yet he maintains that these contextual forces are less prominent today and that adhering to the habit of over againstness can hinder clear thinking within each tradition as well as hinder dialogue between them. Rabbi David Novak, Talking with Christians: Musings of a Jewish Theologian (Grand Rapids: Eerdmans, 2005), 47–49, 66. 5. cf. Maurice Lamm, The Jewish Way in Death and Mourning (New York: Jonathan David Publishers, 2000). See also Dorff, Way into Tikkun Olam, 157–65. 6. Dorff, Way into Tikkun Olam, 107–8. 7. cf. Richard J. Mouw, The Smell of Sawdust: What Evangelicals Can Learn from Their Fundamentalist Heritage (Grand Rapids: Zondervan, 2000), 77–93. 8. John Calvin, commenting on Ezekiel 16:61, Commentaries on the First Twenty Chapters of the Book of the Prophet Ezekiel, vol. 2 (Grand Rapids: Eerdmans, 1948), 174. 9. Ernest Becker, The Denial of Death (New York: Free Press Paperbacks, 1997). 10. A common translation for the Greek word enebrimesato here is “greatly troubled in spirit.” This phrase was often used to refer to horses or of persons snorting with suppressed rage or indignation. Eugene Peterson translates this verse, “a deep anger welled up within him” (The Message: The New Testament in Contemporary Language [Colorado Springs: NavPress, 1994], 213). Zerwick suggests a literal translation of this passage would read, “he let out a groan of indignation from his innermost being”(Max Zerwick, A Grammatical Analysis of the Greek New Testament (Rome: Editrice Pontifico Istituto Biblico, 1996), 321. 11. Cf. Nicholas Wolterstorff has perceptively written that biblical hope and resurrection faith do not smother pain and suffering, yet neither does suffering and death smother hope, but the two remain uncomfortably commingling on this side of the new creation. Nicholas Wolterstorff, foreword to This Incomplete One: Words Occasioned by the Death of a Young Person, ed. Michael D. Bush (Grand Rapids: Eerdmans, 2006], x. 12. cf. Hosea 13:14 and Isaiah 25:8. 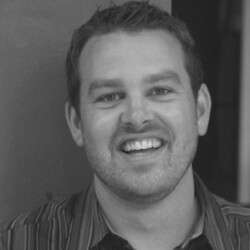 Cory Willson is a theology student at the Center for Advanced Theological Studies at Fuller Theological Seminary. His research interests are in the areas of theology and culture, interfaith dialogue, Judaism, and Protestant Reformed theology. He is a cofounder and editor of the “Evangelical Interfaith Dialogue” journal.